One bedroom has a queen size bed, the other two twins. There is also a carpeted attached garage that gives additional space and has a double bed. You actually enter the house through the garage so, except for the door that makes it handy to bring in luggage, you wouldn't know it's a garage. It sits on a three and a half acre lot right next to the cabin with the addition that we have used for VRBO for the past two years. The original owner built what is now our home for them and this cabin for his folks in the 1950’s. We have lived here for 50 years and find it a special place. 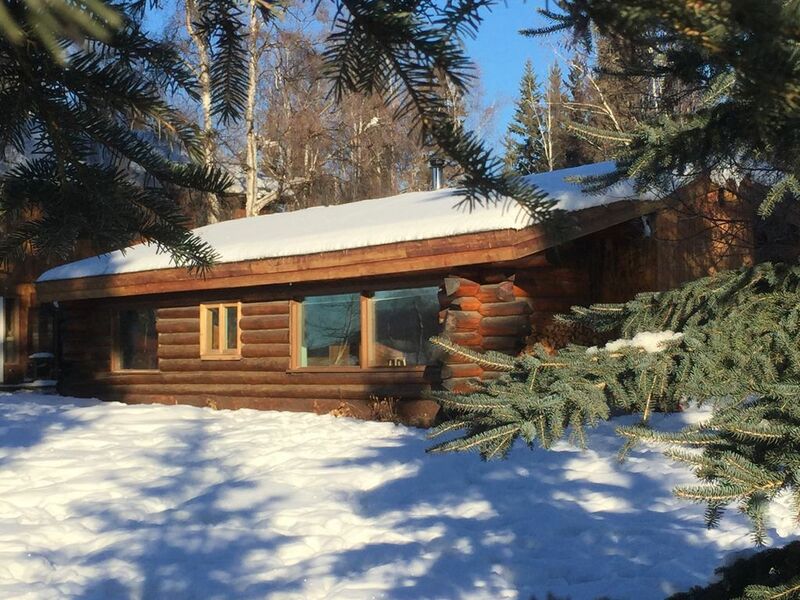 It is on the Chena River across from the Rivers Edge RV park. Cozy combined living room, kitchen and dining area. Great view of the large yard and river out the large windows. Table seats six comfortably when slid into the living room. Also two stools at the counter. The view out of the picture windows was perfect! We happened to be there to watch the ice on the Chena River melt. The view from the cabin gives the feeling of being in a camp ground, in spite of being in a neighborhood. The view alone is worth the stay. Accommodations are as described. All was functional. The ambiance of the cabin was wonderful. Very positive experience. Having been there, I expect the cabin is booked solid, months in advance. If not, it should be. And did I mention the view? Great location, very comfortable cabin and beautiful River view. Very cozy older property. Owners very nice people and accommodating. Privacy a small issue but just caring owners. I would recommend this property. A real fire place would have been awesome. We loved it here. A great location. Close enough to town, but secluded on 3 1/2 acres. The view from the front windows was fantastic. The five of us were very comfortable and the cabin had all we needed. We enjoyed campfires in the snow by the Chena River and looking at the winter wonderland. We had a great week!! Glad you enjoyed it. Was nice having you. Love to share our little bit of the world. Delightful property with very delightful "landlords"
We are so glad we booked this property for our stay over Christmas. It was really cold outside, but lovely and warm inside. The converted garage was perfect for our adult daughter who enjoyed having her own space at times. The best part had to be that Bob and Mardee Roth were so hospitable and friendly. We felt their welcome from the very beginning and really enjoyed benefiting from their long-time experience in Alaska as well as the entertaining stories Bob shared with us. If ever we return to Fairbanks, we absolutely know where we will stay. We cannot recommend here highly enough. Great, cozy place. Right on the river. Easy to find and off the main roads. We were late arrivals. The courteous owners greeted us, filled us in on particulars and we never saw them again. I would definitely stay here again when in Fairbanks.